The W69008Z3 is Cartier's Ballon Bleu series model with a thrilling combination of stainless steel and 18K Gold. The sophisticated timepiece is designed with delicate two-tone gold accents to create an accessory suitable for semi-formal social engagements. 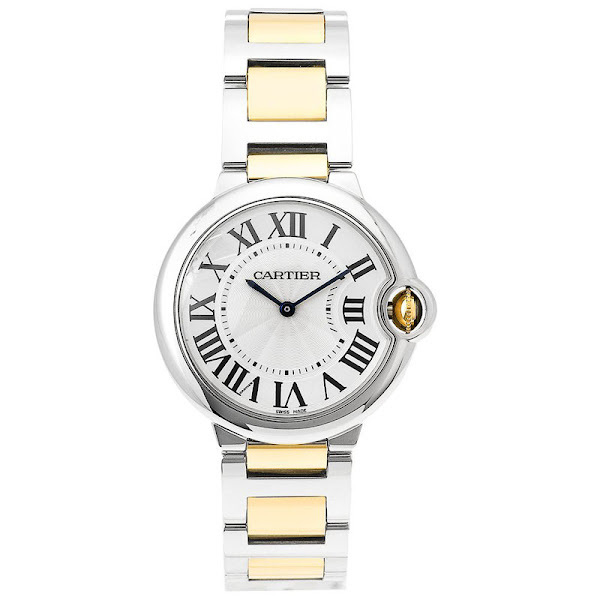 This Cartier watch features a stainless steel case, a stationary round stainless steel bezel, and an 18-karat-gold and stainless steel link bracelet with a secure deployment buckle. Besides, this timepiece has a scratch-resistant sapphire window shields the silvered-opaline dial, which features black Roman numeral hour markers and slim minute indexes. The watch features a precise, superior Swiss-quartz movement. This beautiful piece is water resistance up to 99 feet (30 M). This Cartier Ballon Bleu's original price is $6,900. You can find an original Cartier W69008Z3 Watch at the site(s) listed above. However, we don’t guarantee its availability as being listed here simply means that those site(s) has the item in question by the time we wrote the review. The review in this page is written by garnish at Thursday, September 22, 2011. The post is tagged as analog, cartier, sapphire, watch, women.